Molo Audace, formerly Molo San Carlo, is a place dear to the hearts of Trieste's inhabitants. This walkway extending about 200 metres out to sea is a magical place for a stroll and a breath of fresh air at any time of day and in any season, a place of enchanting autumnal sunsets, when the buildings on the shores are tinged with red. If you fancy a real challenge you can run to the wind-rose at its far end, and try to remain standing against the Bora winds of up to 100 km/h! The pier was built between 1743 and 1751 on the wreck of the San Carlo, a ship that sank in the harbour. Originally 95 metres long and connected to land by a small wooden bridge, the pier has been gradually lengthened and now measures 246 metres. In 1922 the pier was renamed Molo Audace in honour of the destroyer Audace, the first ship of the Italian Navy to arrive in Trieste, on November 3, 1918. A point of interest: the anchor of the destroyer Audace is on display at the base of the Vittoria lighthouse. Many passenger ships and freighters used to dock at the San Carlo pier, and goods, merchants and passengers poured into Trieste from all over the world. Nowadays boats dock only very occasionally at the Audace pier, except during the Barcolana regatta, when they are often triple moored. 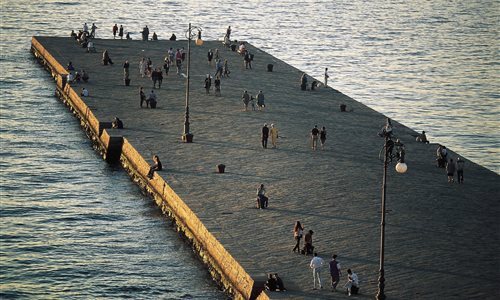 Coming to Trieste and not spending time along this walkway across the sea would be a crime! Don't miss this fascinating experience! Yet in good company, than San Carlo Pier?